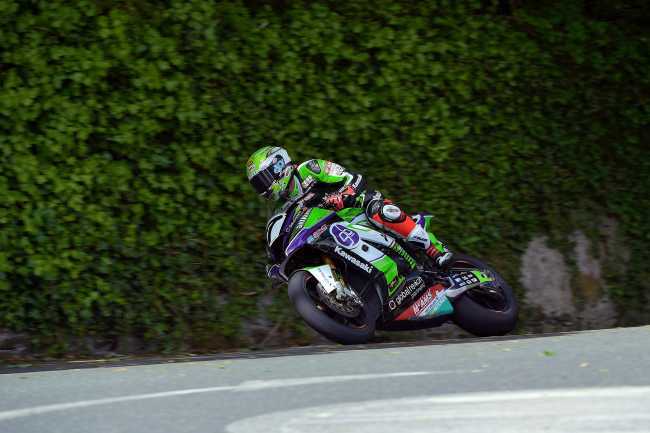 Despite a mix of bad luck and GBmoto Racing Kawasaki rider Gary Johnson slipping off unhurt at Guthries on the final lap, the team enjoyed a strong debut race around the iconic Isle of Man TT course race as they ran in the top six for the majority of the race. 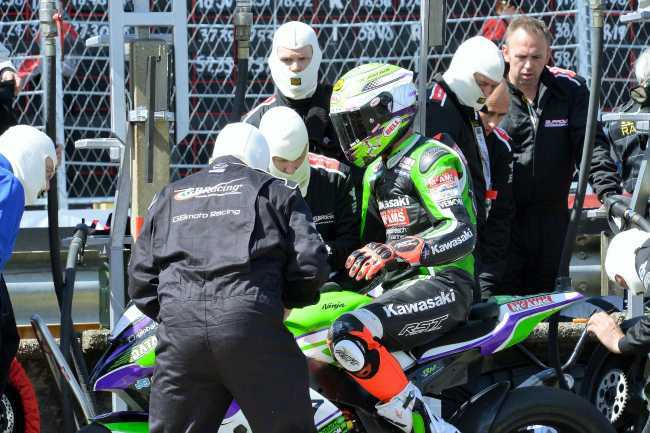 The 37 ¾ mile circuit threw up a fresh challenge for GBmoto Racing Kawasaki on their debut, which coupled with curtailed practice sessions due to the weather, saw them face a race against time to get the Kawasaki ZX-10R Superbike up to speed. Despite the lack of track time and a number of minor issues, Gary Johnson was still able to impress as he set the tenth fastest time ahead of the opening race. Making some significant changes ahead of the Superbike TT, Gary was the seventh rider to leave the Glencrutchery Road and was in fourth place on the timesheets as they passed through Ballaugh for the first time. With the race settling down, the improvements made to the bike saw Gary comfortably run in sixth at the end of the opening lap, setting an impressive 129.726mph lap – his fastest circulation of the course this week, despite starting from a standing start. Remaining in sixth as the front runners pitted for the first of two visits, the team were hit with the first bit of bad luck as their fuelling rig was unable to dispense the fuel at the regular speed, seeing Gary caught in the pit longer than normal. Slipping back to ninth at the midpoint of the third lap, further bad luck struck the team as Gary’s screen broke, offering no protection against the strong winds that accompany speeds of 200mph. Despite this intense buffering forcing Gary to change his riding style, he climbed his way back to sixth by the second pit stop, which went smoothly thanks to the team fixing the fuel pump problem. Maintaining his position over the fifth lap, the final circulation started well with Gary looking set to secure a strong sixth place in the team’s debut TT race. Unfortunately with the lack of windscreen upsetting the bike, he ran a little wide at Guthries corner and hit a dirty part of the track, seeing him tumble out of contention. “After the week we had we can certainly be pleased with how that race went. Obviously to be so close to the finish and fall at the final hurdle is incredibly disappointing. We have struggled with some things during practice, but the team did a mega job to considerably improve the bike ahead of the Superbike race so full credit to them. We had our fair share of bad luck in that race, what with the fuel pump problem and the screen breaking, but we were still able to set our fastest lap and fight amongst the teams who have been competing here for years. “Outside of the final part of the final lap, we had an incredibly positive race and made a significant improvement to the bike compared to practice. We struggled during start of the week with the balance of the bike, but the guys made a bit of a set-up gamble which immediately proved to be a success as Gary set his fastest lap of the week on the opening lap. With the TT seeing the team have to overcome problems on their debut trip to the island, GBmoto Racing Kawasaki Team Manager, Mike Kane praised the hard work of the technicians in the garage, “It has been a tough practice week and was a bit of a slower start than we planned but with Gary’s feedback and the incredible work from the team, we’ve taken steps forward every time we’ve gone out. We’ve been working constantly on developing both the Superbike and Superstock and the guys in the garage haven’t stopped, so a big thank you to them.